My cooking these days feels torn. On the one hand, we’ve been having people over for dinner all the time and when we do, I take it as an opportunity to make those dishes that are just a bit too much of a production for any old night with me and Jonah (i.e. anything from my newest and also favorite cookbook Six Seasons). On the other hand, when it is just me and Jonah I tend to turn to what I have in the fridge. This is a great practice, but when I go to the grocery store, I generally buy the same things for weeknight dinner staples: I pick up some tofu, mushrooms, peppers, leafy greens, onions, occasionally some sweet potatoes, and a bulb of fennel if I’m feeling fancy. These ingredients most often turn themselves into a rice or soba noodle bowl because, well, we love Asian flavors, and it’s simple enough that we don’t have to think about it too much before it can become dinner. But the key to any good rice or noodle bowl is the right sauce. In my recipe box that sits in my spice drawer, I’ve got at least 3 different asian marinades/sauces. They all have roughly the same ingredients, with a couple extras thrown in or substituted. They are ingredients that are used almost daily in my kitchen: soy sauce, rice vinegar, sriracha, garlic, lime juice. Occasionally there will be honey or maple syrup, sesame oil or miso. But this sauce, the one below, it’s different. Instead of being the base sauce for a meal, it’s a sauce that I keep in a small jar in the fridge. I drizzle it on a plate of food when it needs an extra kick, that beloved tingling on the lips, the gentle burning on the edges of your tongue. It’s not too hot – you can still taste all the ingredients in it because the heat is just at the right level where the flavors don’t get lost. I put it on noodles and rice bowls, but I also put it on fried eggs in the morning, orzo salads that need a little jazzing up after a few days in the fridge, and an afternoon snack of avocado. It has gotten to a point where I like to always have a jar on hand, should the need for it arise. And the need does arise. It always comes in handy. What a week it has been. I spent my “weekend” on the coast with my mom and baby sister while Jonah was in Vegas (blech) for work. The coast, Cannon Beach specifically, is one of my favorite places in the world, any time of year. I am guaranteed to breathe deeper, be more reflective, and relax. I am also guaranteed to get teased by my little sister (endlessly), do some knitting with my mom, and visit all our favorite spots. And last night my dad and Darla arrived for a little weekend in Portland, so we’ve been hanging around and eating when I haven’t been at work. Let’s get on with weekend finds, shall we? Ever get to the store, wanting to make pasta, and you see all those cool noodle shapes and think, well I guess I’ll just put tomato sauce on it? Don’t think that. Check out this list of what noodles go best with what sauces. Speaking of pasta and sauces, these are some neat little tricks to add a little pizazz to any bowl of pasta. This beautiful bottle opener would make functional art in the kitchen. I’ve seen a few variations of this bottle opener (including one made locally, which is what I’d prefer to buy, but I can’t remember where I saw it). This is a bottle opener that I would totally hang on a hook in my kitchen, because it is simply pretty enough to be a functional decoration. I love that. 3. Need help eating more vegetables? Try reorganizing your fridge. Tips to eat more fruits and vegetables. It’s now well into January, and the resolutions are becoming more like distant memories… But we can do it! Let’s all go to the gym together! I’m kidding. But this is a great idea to get yourself to eat more vegetables. It’s hard when they’re all hidden and covered in that crisper drawer. I like their idea of getting some clear tubs to use on those shelves so the apples don’t go rolling around and the big leafy greens are still wrangle-able. Uhhhh yes please. It’s that point in the winter when I am getting tired of root vegetables and roasted chicken… this book sounds like everything I want to eat, but am not eating. Want. The posting of the recipe is long overdue, as I made this dish quite a while ago. So I may not remember the exact details of everything I did to make this – but here goes. Have I told you about the unprecedented influx of cookbooks in Annie and I’s apartment? I went from owning exactly zero cookbooks before Christmas and my birthday this year (Jan 6) to having 4. That’s a 400% increase in cookbooks within the span of a month! Anyway, Annie’s mom got me this great cookbook called Plenty, that has some fantastically new and different recipes. This is one of them. A picture of this eggplant with buttermilk sauce recipe is on the cover of the Plenty cookbook, so I decided to make it. It looked like nothing I had ever tasted before, and that’s what it ended up tasting like! Preheat the oven to 400 degrees. Cut the eggplants in half lengthwise (see photo below). Now cut some lengthwise incisions on each half, but not all the way through to the skin. This is just to let the oil and juices get around. Make some more diagonal incisions (I sort of did this like you would cut an avocado before you scoop the flesh out). 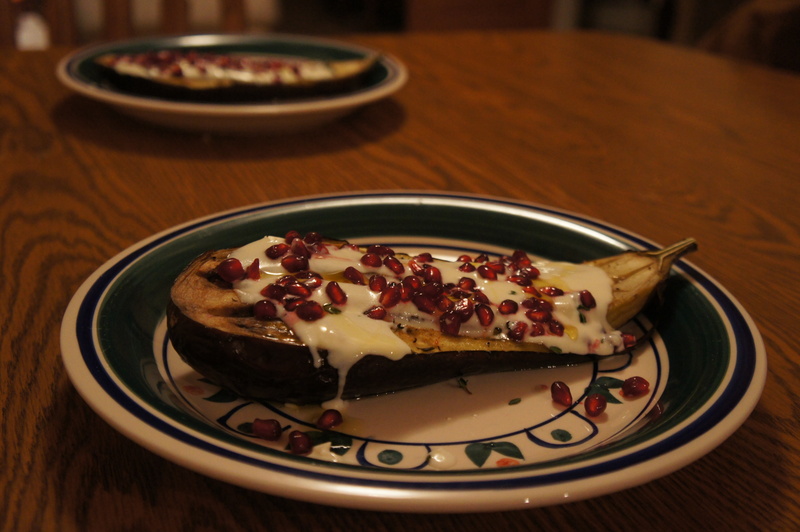 Place the eggplant halves on a baking sheet, and brush them with the 1/2 cup olive oil until it’s all used up. Sprinkle with some thyme leaves and salt and pepper. Roast for 45 minutes, when the eggplant flesh should be soft and browned. While the eggplant is roasting away, let’s do something fun. 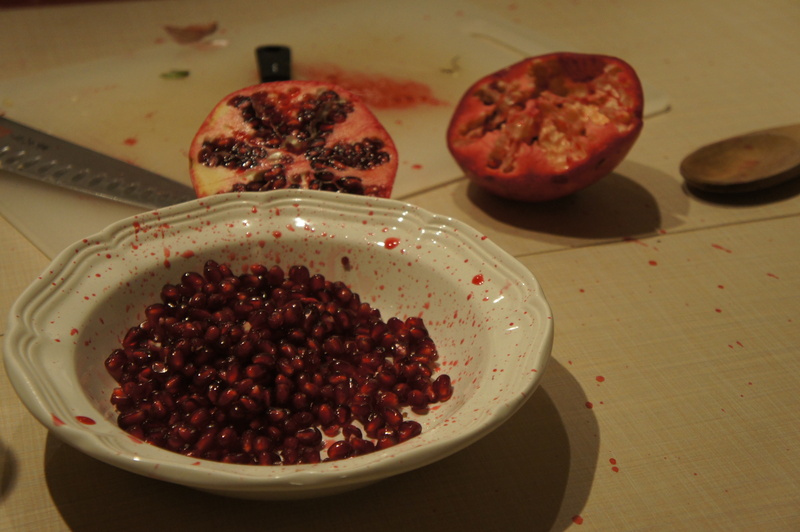 To get all the seeds out without digging through the fruit like a raccoon, start by cutting the pomegranate in half. Hold one half over a bowl with the flesh side facing down into your hand (watch out, your fingers are about to get juicy). Use the back of a wooden spoon and start whacking the back of the pomegranate gently, and then with increased force, until the seeds start to fall out into the bowl. Don’t lose faith if seeds don’t start raining down right away: it takes a minute for them to start getting loose. It helps to flip the pomegranate half over once in a while to gently pull the membranes apart and pick them out. Do the same thing with the other half. Make the sauce by whisking all of the sauce ingredients together in a small bowl. I used Greek yogurt that was honey-flavored, which may have been a mistake. When the eggplant halves are done, serve by spooning plenty of the sauce over the halves. Sprinkle your expertly-harvested pomegranate seeds on top and garnish with some more thyme and drizzle with a bit of olive oil. The taste was amazing – a combination of things I have never tasted in combination before! When Jonah’s parents were in town, we had them over for dinner. My dad had sent me a recipe for these scallops with reduced carrot sauce that he made a couple times when I was younger. This is the recipe that made me discover scallops. I used to think scallops were gross, the texture was a little too slimy for me, so I never ever ate them. But this sauce was so good that I tried one of the scallops that was drenched in it, and now scallops are one of my favorite seafoods. This recipe is from The Herbfarm Cookbook, which is a book my dad uses all the time. The Herbfarm is a restaurant in Woodinville, Washington (near where I grew up). I’ve never eaten there, partially because $$$$$$ and partially because you have to make reservations hella in advance. Anyway, if you’re in the market for a beautiful cookbook with lots of good recipes, here’s one to check out. A warning before we start. This recipe is long. But it’s not really that hard, it just seems hard because there are a lot of steps. However, it is totally worth it because these scallops and this sauce are so delectable. I promise. Just try it. 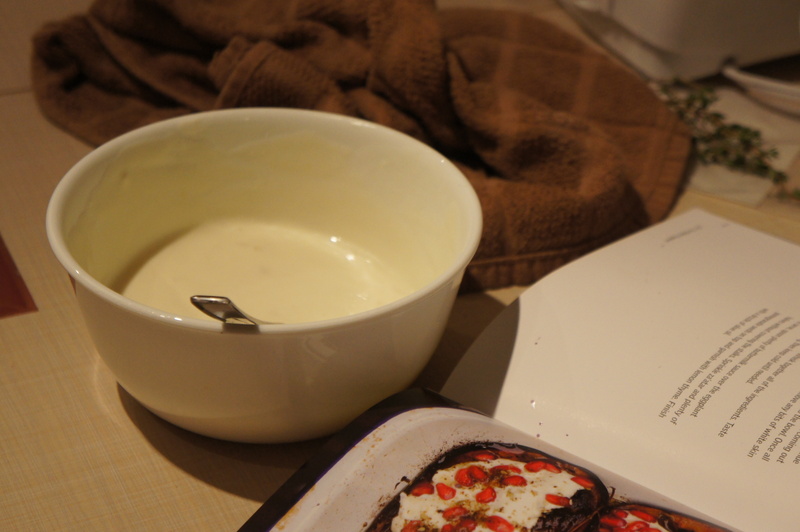 I’m going to type it out in the same steps as in the cookbook because it breaks it down into little pieces. Quite nice if you ask me. Combine the carrot juice, 1/4 cup of the wine, the lemon juice, shallot, and salt in a medium saucepan. Bring to a boil over high heat, then reduce the heat just enough to maintain a steady boil. Cook the mixture until reduced to about 1/2 cup of liquid. The sauce should be thicker, about “the same consistency as pulpy orange juice.” This should take about 20-30 minutes. You can do this step ahead of time and stick the mixture in the fridge overnight. Reduce the heat so the sauce is gently simmering and add the butter, one piece at a time. Whisk the butter in, and wait until each piece is melted and incorporated before adding another. Return the sauce to a simmer, whisking constantly. Add the bundle of marjoram, submerging it completely in the sauce, and remove the pan from heat. Set aside till you’re done cooking the scallops! It’s time to sear the scallops. I’ll let you know that Jonah and I struggled a little bit with this step, mostly because we decided to try to use our cast iron skillet (the recipe says to use a heavy bottomed saute pan). We’ve had some trouble, despite reading about how to cook in a cast iron and clean and care for it, with things sticking to the pan, and can’t really figure out what we’re doing wrong. Anyway. The recipe also says to heat your oven to 175 and then turn it off and you can put the scallops in there to warm them, but our oven was otherwise occupied, so we just put them on a rack on a pan. Pat the scallops dry and season them lightly with salt and pepper. Heat the oil in whatever pan you choose to use until it is very hot and smoking. Using tongs, carefully put the scallops flat side down in the pan. Let them cook without touching them for 2-3 minutes or until the side touching the pan is a deep golden brown. Then turn them and cook them another 1-2 minutes on the other side. When you turn them, you want to preferable put them in a different part of the pan, where there has not just been a scallop. When they’re done cooking, remove them from the pan and put them in the oven or on a rack or whatever you choose to do. Reduce the heat to medium and add the other 1/4 cup of wine. Scrape up the little browned bits in the pan and add the liquid from the pan to the carrot juice. Remove the marjoram bundle from the carrot sauce, squeeze it dry, and get rid of it. Reheat the sauce over medium heat, whisking in the oil/wine mixture from the scallop pan. Season to taste with salt and pepper if needed. If you want the sauce to be super smooth, you can put it through a fine sieve. I like the little scallop bits and shallots, so we skipped the straining. Now put the scallops on plates, dress them with the sauce, and enjoy!